"Amelia thrums with a cast of ghostly personae." "Brings a corner of the Civil War vividly to life … rich in language, history and ideas … tour de force. 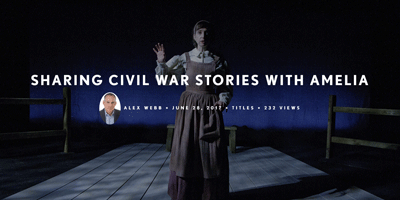 Webb's play mines an intriguing sidebar of the Civil War - several hundred women fought in the war disguised as men." "Amelia recreates Civil War history with uncanny accuracy and delivers a knockout story of young lovers caught up in one of history’s great wars." "Alex Webb has crafted an ingenious tale…The narrative is historical, yet relevantly feminist, emotionally brutal, yet romantic, and constantly upsetting, yet amusing." "After 90 minutes in a room with just two bodies on stage, you leave with a head full of vivid pictures, indelible images of woman consumed by her purpose, and a nation consuming itself." "This simply presented production exemplifies the astonishing power of theatre to unexpectedly grab you and carry you off into an adventure of the soul." "I don’t think I was the only attendee who was weeping at the end of this play, a tour de force." "Thoroughly compelling… One of the more refreshing aspects about Webb’s script is how much artistry it allows for in theatre-making." "Webb has an admirable facility for colorful and evocative language, able to create many believable characters, settings, and circumstances with nothing but the actors' words and motions." AMELIA is an epic Civil War tale of one woman's search for her husband across the battlefields of America. The story culminates at the gates of the notorious Andersonville prison camp.